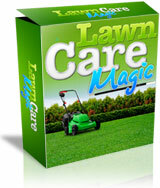 Lawn Care Magic - Make Huge Passive Income As An Affiliate. Lawn Care Magic is a digital program that teaches you how to grow the perfect lawn fast and without any weeds or pests. This is the complete program that you can provide to the increasing number of people that are searching to learn how to grow their lawns. You will earn a whopping commission of 75% per sale by just referring this program to those people, while at the same time they will thank you for helping them to achieve their goal. New to ClickBank? Sign Up Completly Free and start earning huge passive income by selling Lawn Care Magic for a 75% commission per sale. Refer people to purchase Lawn Care Magic through your affiliate link and ClickBank will take care of the rest. They will track the sale all the way from your link to purchase. Writing Reviews - Write Reviews about Lawn Care Magic and let people know how great this program is. Include your affiliate link at the end of the review, and then post your review to free sites such as GoArticles.com, EzineArticles.com or your own website. Blogs - Create a free blog using the services offered by Blogger.com, WordPress.com, HubPages.com, about Lawn Care Magic, including your affiliate link. Are you interested in promoting Lawn Care Magic but require some kind of assistance? Would you like to ask further questions? No Problem!